No matter what party controls Congress, or who is President, corporate taxes will never increase as a share of GDP or as a share of corporate profits. If anything, the rate will only go lower, more deductions will be added, and the same tax breaks they already have will be extended (making some permanent) — just like they did in the last spending bill. If anything, the corporate tax rate will be lower with a Republican president next year. If an American company (e.g. Nike, Apple, etc.) built a factory in China (depriving American workers of jobs, who would otherwise have paid income taxes and payroll taxes) or used a contract manufacturing firm (such as Foxconn for "factoryless" manufacturing*) to manufacture products to sell in China — but also to import and sell in the United States — they would have to pay the Chinese government corporate taxes. And so, should they complain if they would also be taxed by the U.S. for repatriated foreign earnings? In January 2013 Senator Bernie Sanders sponsored the Corporate Tax Fairness Act, which would require U.S. companies to pay taxes on all of their income by ending the deferral of foreign source income — and to stop profitable corporations from sheltering income in the Cayman Islands and other tax havens. The legislation was intended to end tax breaks for companies that ship jobs and factories overseas. PTC (August 28, 2013) Should Offshore Manufacturing be counted as U.S. Production? Economic Policy Institute (July 21, 2014) What Is Manufacturing and Where Does It Happen? Industry Week (August 1, 2014) Manufacturers Agenda: Will Some Offshore Production Be Counted as US-Based? In These Times (August 8, 2014) Made in the U.S.A.? Related: How the iPhone widens the US trade deficit with China (VOX and Forbes) Apple is just but one example. We could have also used Nike too. Should an American company be allowed to merge with a foreign company (see tax inversions*) to move their headquarters to a foreign country to avoid corporate taxes? If not, should their products/services be banned in the U.S.? Would it be fair for an American company, who used the U.S. market and infrastructure to establish and grow their company, and then move to a foreign country — all while the company executives still enjoy the benefits of American citizenship and all the privileges, rights and protections of U.S. laws — while also avoiding paying their fair share of corporate and personal income taxes? If these same companies consistently make record profits (year after year) while paying themselves enormous compensation packages — all while paying their domestic and/or foreign employees low or stagnant wages (costing the taxpayer billions in government services) — and all while spending millions more than they paid in taxes to lobby Congress and contribute campaign donations to politicians (spending billions to get trillions) to get our leaders to pass tax and labor laws that are most favorable to them — should they continue to avoid being prosecuted and sent to prison (paying only a fine on behalf of the company) when the company's executive's personal actions contributes to unsafe and/or deadly products — or when they fraudulently rip off consumers in business (like the bankers who were too big to jail) or when taxpayers are robbed in defense contracts and through Medicare fraud? Our government leaders have allowed a record number of mergers and acquisitions to create powerful monopolies in the economy (cable TV is one example). Large "multi-national" corporations are dominating our daily lives, our politics, the media, and our democracy. Like graffiti, their corporate logos are on everything; but many can no longer proudly claim "Made in America" like they once could 30 or 40 years ago. Even in America, many of us are working for foreign companies (and many may not even realize it). The American people want change, but these corporations own our politicians at every level of government (our courts, Congress, and even the White House). Elections are deliberately fixed (voting laws, gerrymandering, voter registration, etc.) to maintain the status quo of our duopoly political system. And no, it's just not the GOP doing this. The Democrats (when they had both chambers of Congress and the White House) could halve changed the tax code, federal election laws and raised the minimum wage. But they didn't, so we can't just blame the Republicans. And because the election process is so corrupt (like a cancer, eating away at the very foundation of this once great and exceptional nation), we'll never see anyone like Bernie Sanders as President — let alone a majority in Congress that have progressive values and puts the wants and needs of the American people first and foremost, before their own personal ambitions — which usually requires fulfilling the desires of the richest people who own and/or run these multi-national corporations and contribute to their super PACs and campaign treasure chests. Half in Congress are currently millionaires. How did they manage that? Buy buying stocks with inside knowledge? Those people — the political and business "leaders" who engage in these type of activities — should all be ashamed to call themselves patriots or Americans, when they have been traitors to average working Americans when it comes to trade deals (such as TPP, TTIP and TISA, or NAFTA and PNTR for China), election rules, campaign finance laws and the tax code --- for shame, for shame, for shame! The very least our politicians could do would be to make sure corporations paid their fair share of taxes — and if the cash from profits is being funneled directly into the CEO pockets with capital gains, then raise that tax rate. Hire more IRS auditors to make sure they're complying with the law. However, the claim that American business is suffering seems awfully hard to square with the data. The figure below shows pre- and post-tax profit margins in the U.S. non-financial corporate sector. The profit margin is the share of unit prices that is claimed by profits rather than employee compensation or other business costs like depreciation. Both pre- and post-tax margins have been extraordinarily high in recent years, with each reaching their highest levels since the mid-to-late 1960s. In other words, there is little need to increase our coddling of corporate profits. Bob McIntyre of Citizens for Tax Justice told CBS MoneyWatch: "Since the 1950s the share of federal income tax revenue paid by corporations has dropped from 40 percent down to around 19 percent these days." But Politifact rates Bernie Sanders statement as only "mostly true" rather than 100% "true" because one type of corporation (the S-corporation) pays taxes on its profits through the individual income tax returns of the owners. But then, if that's the case, Politifact should also have noted that the reason for this is, profits aren't distributed as regular wages to individuals, but in other forms that are taxed as realized capital gains (such as those earned from stock options) — which are taxed at 23.8% (before allowable deductions) rather than the corporate rate of 35% (before allowable deductions). The Tax Policy Center has charts showing the capital gains tax rates and income as realized gains — and the correlation between the two different tax rates. 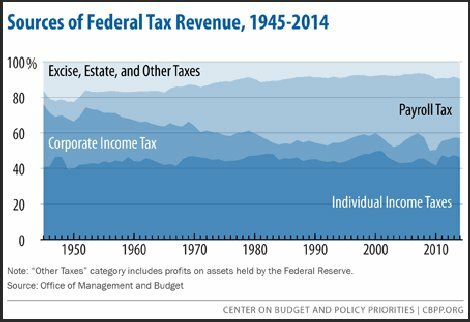 And their chart below shows what corporations have been paying in taxes as a share of GDP — reflecting what the St. Louis Federal Reserve also shows. The National Priorities Project agrees with The Center on Budget and Policy Priorities for individual income taxes (46 percent) but shows 13.5 percent comes from corporate taxes (rather than 9%). In the post Tax Facts by James D. Agresti and Christopher Edward Bohn, they say 11% comes from corporate income taxes. To be "fair and balanced", the Tax Foundation, which is a pro-business and conservative-leaning think tank with ties to various US conservative groups, puts a different spin of the corporate tax rate (double taxation, etc.) and says: "There's more to this story..."
But whether corporations currently pay 9%, 11% or 13.5%, historically speaking, all the citations show that corporations (because of the many various different tax strategies that Congress has enabled them to use), are currently paying significantly less than they once did — like in the good ole days when we had a thriving middle-class and a healthy infrastructure. So no matter what the "statutory" rate is (currently it's 35%, but it could be 90%) — it doesn't really matter, because the average "effective" tax rate they're paying is much lower. If most of their profits are being funneled to shareholders and company executives as capital gains, then that tax rate should be the same as the corporate tax rate — or taxed as regular wages. The top marginal rate is 39.6% for individuals with regular incomes over $413,200 — but billionaires are paying 23.8% on millions of dollars a year in capital gains revenue, even though it's "personal income" going into their private bank accounts. The U.S. system of taxing multinational corporations’ earnings encourages companies to direct more investment abroad, either in reality or on paper. The fact that the earnings of the foreign subsidiaries of U.S. corporations are not taxed until they are officially transferred to the domestic parent company leads to an incentive to “permanently reinvest” funds in low-tax jurisdictions and indefinitely defer paying U.S. taxes. This incentive has resulted in multinationals parking huge sums of profits in tax havens (such as Luxembourg, Bermuda, and the Cayman Islands). Eight of the biggest U.S. technology companies added a combined $69 billion to their stockpiled offshore profits over the past year, even as some corporations in other industries felt pressure to bring cash back home. Microsoft Corp., Apple Inc., Google Inc. and five other tech firms now account for more than a fifth of the $2.10 trillion in profits that U.S. companies are holding overseas, according to a Bloomberg News review of the securities filings of 304 corporations. The total amount held outside the U.S. by the companies was up 8 percent from the previous year. By now it's pretty much common knowledge that, over the years, corporations have been paying less and less of their share of corporate taxes using various different tax strategies ... and they have also been paying less and less wages as a share of worker productivity ... and they have also been hoarding more and more of their profits offshore ... and they continue to pay higher and higher compensation pay packages to their corporate executives ... and they will continue too use low-wage labor offshore ... and/or use automation and robots whenever they can. So that's not news. And it's pretty much common knowledge the Republicans won't do anything about it ... and it's pretty much common knowledge that the Democrats will only posture and talk about doing anything about it. In other words, don't expect anybody to do anything about anything. So don't expect any change any time soon — unless of course, a Republican is elected as President next year. Then corporations and the rich will pay even less in taxes, and more jobs could go overseas, and wages will definitely continue to remain stagnant — or even go lower if they eliminate the minimum wage laws. The Democrats and the Republicans will bicker between themselves publicly on this issue, but in reality, behind closed doors, neither party will do a darn thing to reform the tax code. We would need a dictator to do that. Or a President Bernie Sanders with a Congress packed full of "democratic socialists". The New York Times, CNN Money, Reuters, International Business Times and Fortune reported at the Economic Policy Institute's report: Wal-Mart’s growing trade deficit with China has displaced more than 400,000 U.S. jobs. CBO: "BEA calculates profits by subtracting the losses of unprofitable businesses from the profits of profitable ones, but unprofitable businesses do not typically pay corporate income taxes ... Corporate income tax receipts have averaged less than one-third of the amount of payroll tax receipts over the past few decades." What would Bernie Sanders do about taxes? 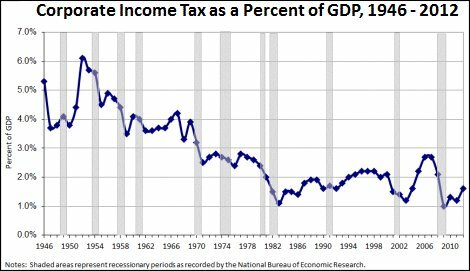 * Bernie Sanders wants to tax capital gains (currently taxed at 23.8% — which was 40% in 1979) the same as ordinary income. The "Feel the Bern" website has more, including his plan for corporations. They won't do anything about corporate welfare because the U.S. government is owned, lock, stock, barrel, by the same corporations.